Did you mean: magnus robot fighter 25 1993 (110 items)? Magnus Robot Fighter #25 - 1993 Valiant Comics - Near Mint NM NM- High Grade! 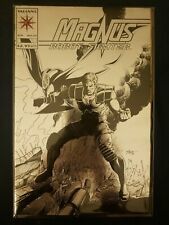 MAGNUS ROBOT FIGHTER #25 Valiant Comics 1993 Foil Embossed Cover NM Ostrander! MAGNUS ROBOT FIGHTER #25: "Silver Foil". June 1993, Valiant Comics..